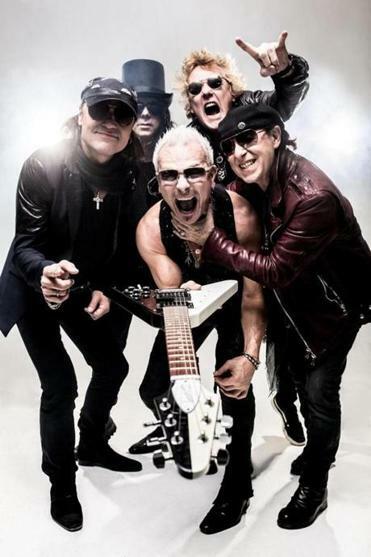 he Scorpions are guitarist Rudolf Schenker (center), vocalist Klaus Meine, guitarist Matthias Jabs, bassist Pawel Maciwoda, and drummer James Kottak. A funny thing happened on the way to the finish line for the Scorpions, a German heavy-metal institution on a farewell tour that was set to conclude at the end of 2012. Poring through the archives in search of fodder for a “bonus-tracks” collection of material left over from albums made during the group’s ’80s heyday — “Blackout,” “Love at First Sting,” “Savage Amusement,” and “Crazy World” — guitarist Rudolf Schenker uncovered a book that his mother had given him in September 1965: a ledger tallying the money his father had loaned him when he founded Scorpions that month. “I went with this book down to the studio and said, look, guys, next year is our 50th anniversary. This is something very special,” Schenker said in a recent telephone interview. “Our manager immediately said, ‘It would be fantastic if you would celebrate that, because there is no other German band who can celebrate this.’ ” Indeed, he noted, only a handful of groups anywhere have hit that elite mark: hallowed names like the Rolling Stones, the Who, the Beach Boys. Spurred by a milestone year, the Scorpions — Schenker, vocalist Klaus Meine, guitarist Matthias Jabs, bassist Pawel Maciwoda, and drummer James Kottak — finished “Return to Forever,” a deft blend of recycled material and fresh tunes with vintage hooks and crunch. Also newly completed is “Forever and a Day,” a terrific documentary featuring rare archival reels alongside present-day live footage and candid interviews. (A one-day cinematic screening is planned for Oct. 14.) With so much to look forward to, Schenker says, no one wanted to think about stopping yet. Q. “Return to Forever” started out with the band digging through old material abandoned during the peak of your radio, TV, and chart success. How did things change when you realized that your 50th anniversary was at hand? A. We were working on the old DNA of the Scorpions, so we were really into this vibe. Because we’d worked with our producer team from Sweden, Mikael “Nord” Andersson and Martin Hansen — Mikael is a great guitar player, and growing up in Sweden, one of the first albums he bought was “In Trance,” and he became a Scorpions fan — he gave us, with his partner, this feeling of the possibility of making this album very fresh. By thinking about this new album for our 50th anniversary, we thought we had to do the stuff from the bonus-tracks album even better — here and there a new chorus where the old chorus was not strong enough — and then we said we had to have some new songs. Q. Gigantic hits aside, what accounts for the band’s longevity? A. I’ve always said we’re standing on three platforms: love, peace, and rock ‘n’ roll. That’s Scorpions: love for “Still Loving You,” peace for “Wind of Change,” and rock ‘n’ roll, “Rock You Like a Hurricane.” Coming from Germany, with the history of the world wars and all that stuff, we had in mind to build bridges between the generations, between the religions, between different philosophies, and between different countries. And I think that’s why we are still together. Q. At 66, you’re in amazingly good shape. How have you managed to preserve your health? A. In the late ’60s I started doing yoga and meditation. I was close to leaving music and going to India to do only meditation and live in the Himalayas. Then later on, noticing that when you spend a year in the studio, sooner or later you will have problems with your back, I started with sports; before I started with music I used to play soccer. And of course the great chemistry in the band is very important. When somebody in the band went too far, the other guys always went, “Hey, you have to think about that.” So we’re helping each other not getting lost in this global world of rock ‘n’ roll. Q. On the summer festival circuit in Europe this year, you dug deep into the catalog for old tunes like “Top of the Bill” and ”Speedy’s Coming.” Is anything going to change for the States? A. No, we want to do the same thing. When we started our 50th-anniversary tour on the first of May in China — and then we played Korea, Russia, Poland, and France on big festivals, and England — we played this set list, and there was such great response that we said, Why do we have to change anything? We have a state-of-the-art stage show, a multimedia stage set; everything is perfect. And especially in America, where they have really high expectations, we want to give the best. Q. This tour runs through the end of 2016. What’s next for you, then? A. My brother [guitar hero Michael Schenker] is already very angry at me, because I said to him when we were on the farewell tour, let’s make a Schenker Brothers album. I haven’t played with my brother for a long time — maybe here and there on a Scorpions stage, like in Wacken, but not in the studio. I think it would be a great thing to do, and there’s a lot of people waiting for it. Interview was condensed and edited. Steve Smith can be reached at steven.smith@globe.com. Follow him on Twitter @nightafternight.